Learn how to restore your Canon Pixma MP280 printer by hand at any given moment. The Canon Pixma MP 280 printers have become really popular lately, this is due to the easy installation of Continuous Ink System and their predominant low price for high-quality prints. With this particular printer, you will be able to scan, make copies and print; this printer gives the best performance. But you must not forget that this model was created for domestic use only if you print, scan or make copies in large number it will reduce the durability of the printer and get more error. We already made a post about refill the Canon CL-211 Color and CL-210 Black Ink Cartridges. Refilling the ink cartridge is an easy process once you have identified the hole where the ink will be inserted. Sometimes the page counter software is directly installed to the printer's driver this can it difficult to reset the ink cartridge. The page counter is a program that keeps track of the number of pages printed with every ink cartridge you’ve placed inside your printer. It doesn’t actually know how much ink is left inside, but how many sheets has been printed in one particular moment. It will tell the printer the ink cartridge has ran out once it reached the set number of pages that was mean to print. Restoring your printer will only delete this record so the ink cartridge can be recognized as new. However, the error will reappear after you have reached the page limit set, you will have to restore your printer one more time. This restoring procedure works on the following error messages: E 1.6 error / E 0.4 error / E 0.5 error / P07 error / E5 error. You could also be interested in learning how to refill Canon 210 Black and 211 Tricolor ink cartridges. 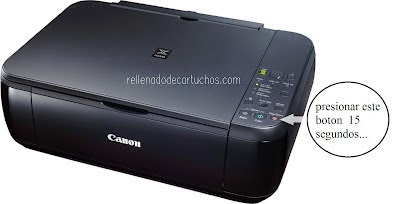 Reset indicator on Canon Pixma MP280 printers. After pressing this button for 15 seconds as indicated, the printer will start making a noise as it printing, this noise might last 15 seconds as well. Once the process completed the printer should stop blinking and all of the error messages eliminated.